I was contacted by the Culinary Content Network, which is a subsidiary of The Daily Meal, to see if I would like to enter a chicken recipe contest. All I have to do is make a healthy chicken recipe for two in under 30 minutes, using up to 12 ingredients. Sounds easy to me! Actually it sounds like something I do all of the time. With those kind of requirements I was in!!! The contest is through Plated, a company that creates fabulous healthy dishes and sends you the ingredients and recipe to make the dish at home. I think that is a pretty clever idea, especially for someone who likes to cook, but not shop. Everything you need is right there. For the contest, all you have to do is submit your best recipe for a delicious chicken dinner and you could be selected for a spot on the week of October 14th menu. How cool is that, if my dish made it? Crossing fingers! he he With my chicken dish I went with a simple, full of flavor fall themed salad. Plus, it’s healthy, easy to make and quick too!!! 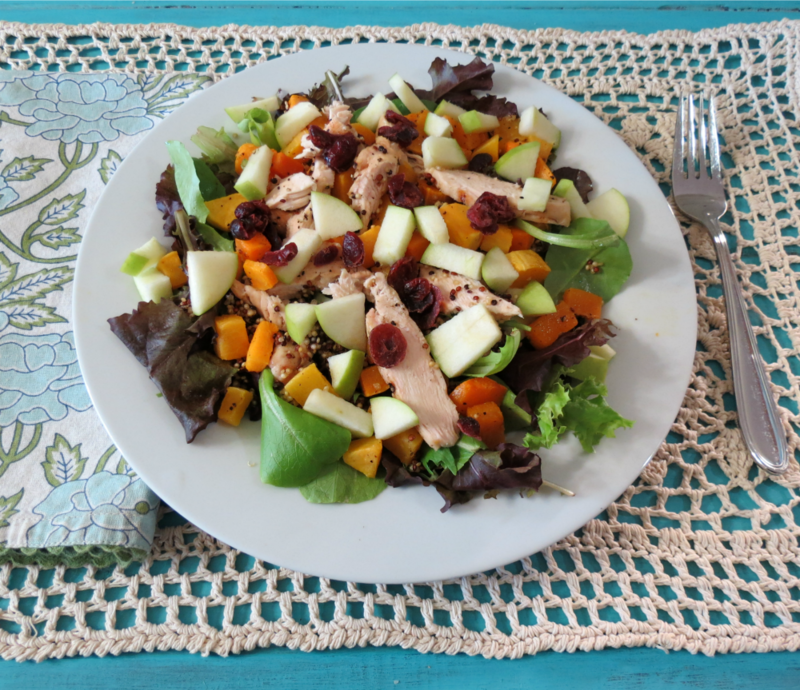 I was inspired to make this salad because of all of the Fall produce and all the seasonal meals that were appearing at several restaurants. I also wanted to create a recipe that screamed my name and this dish has it! 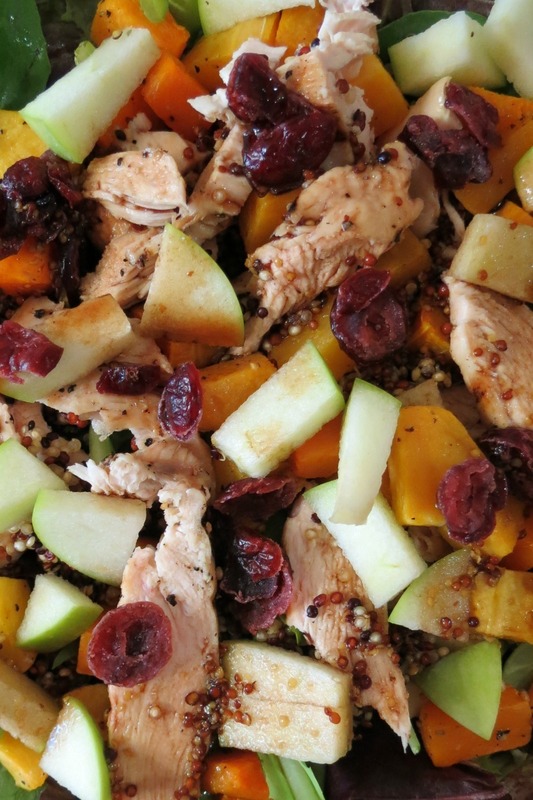 It’s full of pan fried chicken, roasted butternut squash, tri-color quinoa, apples, dried cranberries and to bring it all together a balsamic maple syrup dressing. The dressing is to die for! It tastes like a balsamic dressing, then bam! You get hit with maple syrup. It is fabulous on every ingredient in this recipe. I could so drink this dressing! I’ll be making it for several other recipes in the future. Plus it’s super low calories, and no fat!! You have to love that!! When I made the quinoa, I went the quick route and microwaved it. It only takes 6 minutes in the microwave. It turns out fluffy, but it has a slight crunch to it, which is a perfect addition to the salad. I love quinoa and I don’t cook it nearly enough, I think it is because my Husband doesn’t care for it. I don’t get why? It’s amazing and so healthy for you. Next time you need to make quinoa, try microwaving it! It’s so quick and convenient! 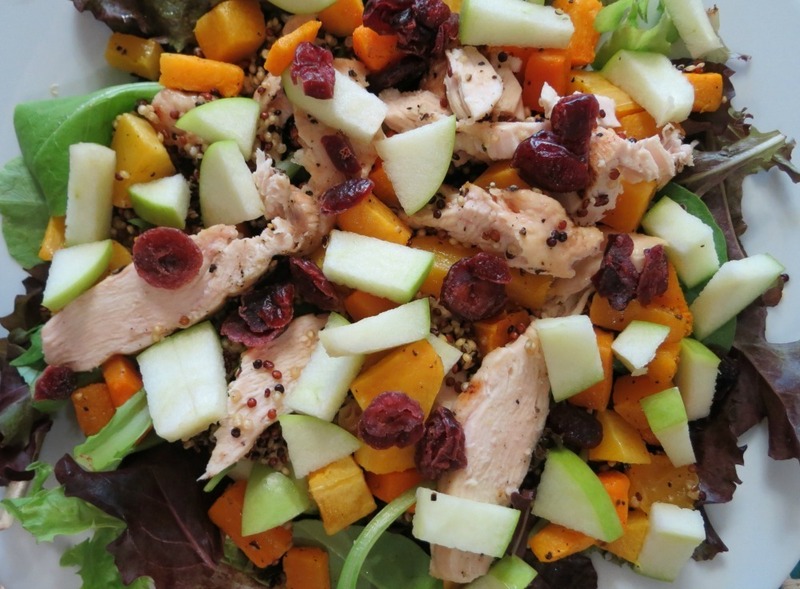 Tender chicken on a bed of mixed greens, topped with roasted butternut squash, quinoa, fresh apple and drizzled with homemade maple flavored dressing. Meanwhile, when squash is cooking, heat a frying pan with olive oil, lightly season chicken with salt and pepper. Add chicken to skillet and cook over medium heat for 5 minutes on each side or until chicken is no longer pink. Set chicken aside to cool. Once cool enough to handle, slice chicken in thin slices. Meanwhile, In a microwave safe dish, add ½ cup water and quinoa, cover and cook for 2 minutes, then remove from heat and stir. Heat again for an additional 4 minutes. Stir and let stand for one minute. To make dressing: in a bowl add all of the dressing ingredients and whisk together. Pour over top of salad. I just love these kind of salads. They are so filling and easy to make. 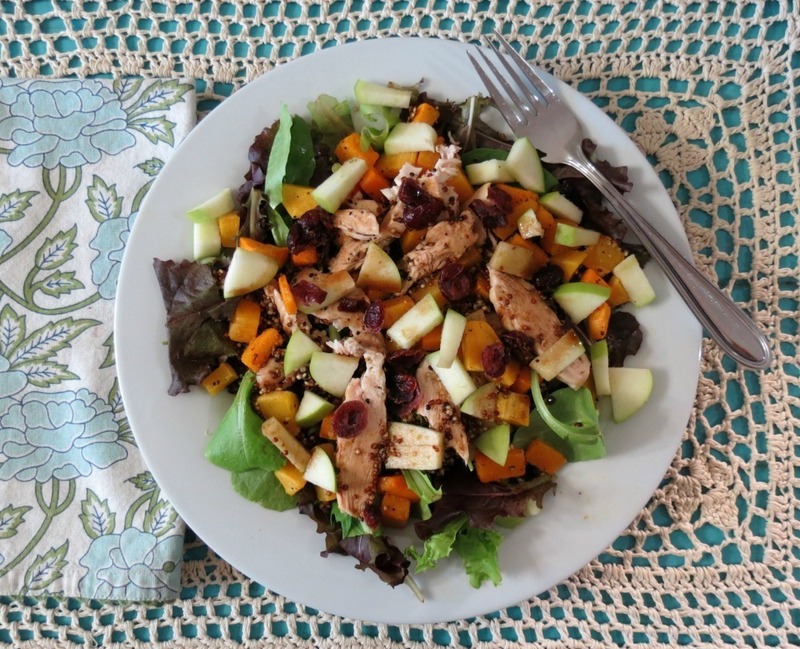 If you batch cook, next time make some squash, chicken and quinoa, then you could throw this salad together in 5 minutes. Plus have the leftover ingredients to make other fun dishes throughout the week. 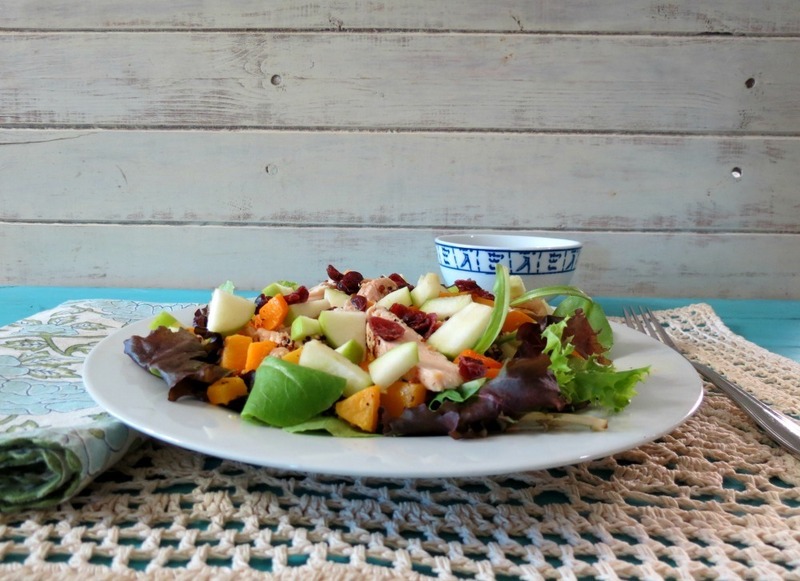 The salad makes for a great dinner and an excellent lunch. If anything, try the dressing! You will fall in love with the flavor. I love the maple syrup taste in it!! Wish me luck in the contest! I can’t wait to try this salad! Such an interesting take on dressing too, looking forward to trying it as well. I don’t get to cook quinoa enough either, my partner isn’t into it which I also don’t understand. It’s so good. Thanks for the microwave tip. Good luck in the contest! Thank you Jodie. Microwaving quinoa is so quick and convenient and you can make just a single serving, which is nice. Now that I know that microwaving works, I can make it more often, just for me. Such a great combination of flavors! And the dressing sounds delicious. I love dressing recipes that call for little to no oil. I’ll be making this. Let me know what you think if you do make it. This recipe definitely sounds like a winner! I am intrigued by your balsamic maple dressing because we recently had a maple-champagne dressing made with champagne vinegar, & it included olive oil. I was able to duplicate it pretty well, but yours sounds so much easier. 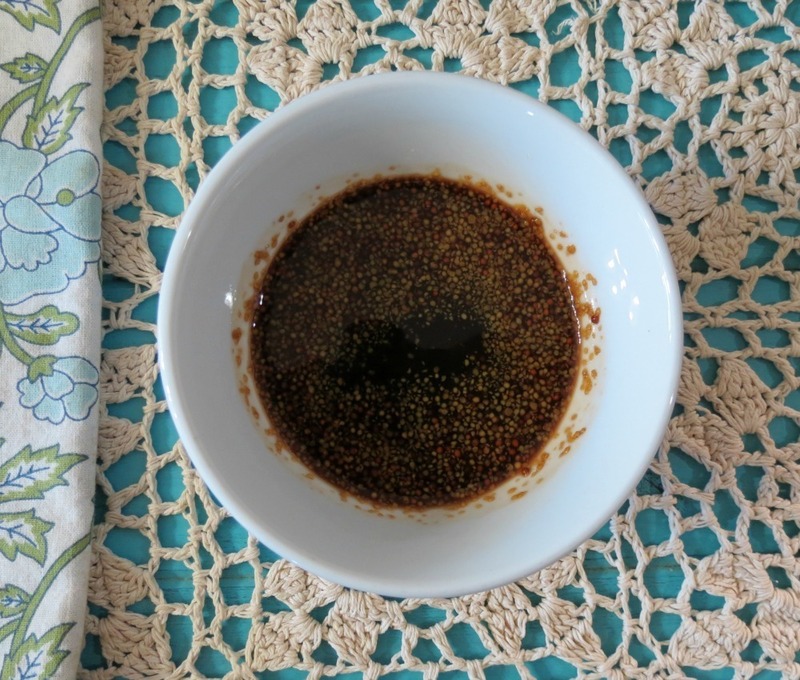 We usually just put straight balsamic on our salads, but this recipe is definitely worth trying.